Welcome to my comprehensive guide for the Zero. This guide has everything a Zero needs to know varying from skill builds to AP distribution to training spots to equipment to medals! We have everything you need to know! Note: Currently under construction in accordance with the RED Update. Do not be surprised by spelling errors, grammatical mistakes and missing content. 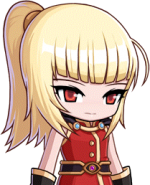 Zero, the children of the goddess of time, Rhinne, is a Warrior class in Maplestory and the Second addition to the RED Update. Rhinne, the Goddess of time, anticipated the day that she would be imprisoned by the Black Mage so in a last resort, she forged a child named Zero. The Black Mage knew of the dangers Zero would bring so he ordered his commanders to split the child into two separate beings, one boy and one girl and to be banished into the Mirror World. The boy, named Alpha, would serve under the Shadow Knights, an organization built to fend off the evils terrorizing the Umbra Temple outside of their hometown of Shadowvale. As time grew by, Beta grew suspicious of the Knights and what was inside the temple. His suspicions were truly confirmed when he realized that the Knights were guarding a young woman; his female counterpart, named Beta. The Knights grew wise of Alpha's actions and attempted to stop him from releasing Beta to no avail. Beta escapes the temple with Alpha and the two teams up to know the Knight's true intentions and where they had really came from. Zero brings a couple of special features not available to any other classes. For starters, Zero boasts a "two-in-one" mechanic in which allows you to either switch from Beta to Alpha or to have the two available in unison at the same time. Each character gives a different feel during gameplay and each have their own role. Unlike the other classes, Zero starts immediately at level 100 instead of level 10 or 1. While this appears to be too good of a fact, Zero is only able to perform quests and level up in Mirror World much until level 180; they are able to travel to Maple World whenever they want, but they are unable to take quests, gain EXP or fight monsters or bosses until their storyline quests are finished, which is at level 180. The class, like the Demon, Kanna and Angelic Buster, does not use MP but instead uses their own energy source called Time Force. Much like Demon Fury, Time Force can be obtained by attacking your enemies and can recharge over time. 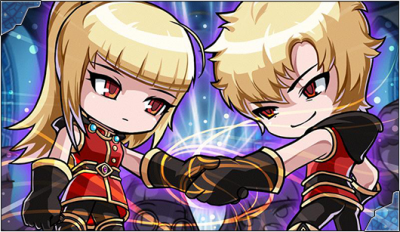 On the matter of equipment, Alpha and Beta will share the same armor and accessories however because you play as both genders, they are unable to wear gender specific equipment. They can wear gender-specific Cash equipment as they don't share the same Cash inventory. They are also able to have their hair, skin and face changed independently as well. As mentioned above, Zero allows you to play as either Alpha or Beta, each have their own roles in combat. 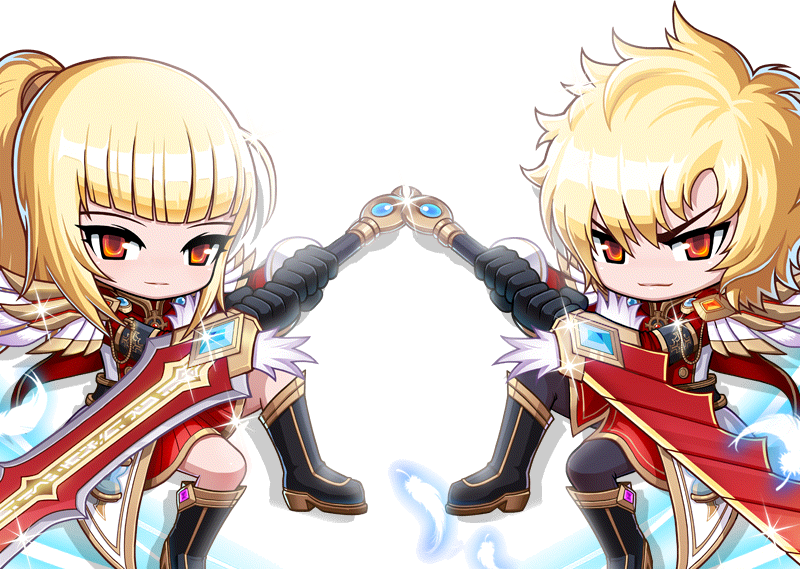 The common mechanics they share is their ability to link their attacks, much like Hayato or Thunder Breakers. You start off Zero with only few skills in your disposal. 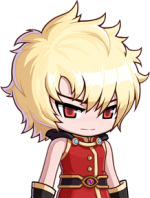 The class does not have any job branches or advancements, instead new skills are given to the player at intervals of 5 or 10 levels up to level 200. Zero does not possess any Hyper Skills, either. Alpha's gameplay focus primarily on delivering rapid-fast multi-hit attacks on enemy mobs while being as mobile as possible. His weapon of choice is the Tachi, a long and thin sword. It's governed by Lapis, the spirit inside his weapon. For skills, See: Zero: Alpha Skills. Beta's gameplay focus primarily on heavy defenses and delivering singular, slow but hard-hitting attacks towards her enemies. Her skillset gives her a prominent edge over boss enemies. Her weapon of choice is the Big Sword, a well-endowed weapon. It's governed by Lazuli, the spirit inside her weapon. For skills, See: Zero: Beta Skills. 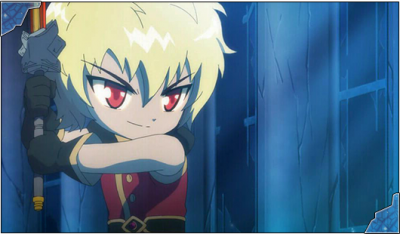 The male counterpart to Zero and is the starting character before you meet Beta. The female counterpart of Zero who was bound for quite some time until she was rescued by Alpha. You must do the zero story line in the mirror world until 180. This page was last edited on 29 December 2013, at 02:59.